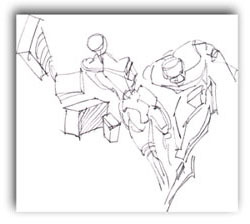 In the first part, Drawing Basics, you saw the general skills of observation - five of them actually, the five core skills of drawing. Now you just might find yourself asking the question "OK, you showed me the basic skills, but how do I apply them? Where in my drawing should I be aware of using them? How do I remind myself to use them?" No need to burden yourself with memorizing them right now. Just refer back to them as needed, or review this list from time to time as you go through this page. Want to go back to the Drawing Basics page? Click here. small step at a time? Click here. vase-face drawings - click here. Exercise One - doing your first drawing. Stepping up to more complicated vase-face drawings - click here. even if you were sure you couldn't - click here. Getting deep into your artistic right brain - click here. Pure Contour exercise - click here. 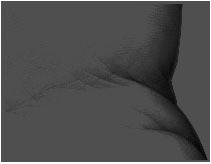 Adding accuracy to your "raw" contour drawings - click here. it in your drawings - click here. you learned on this page - click here. And what are we going to do on this page? We're going to take a look at some basic drawing lessons that employ all those skills you read about on the first page. You can understand them in your head, but I want you to experience them. It's much more powerful that way. Here's the basic, king of them all example of "Drawing on the Right Side of the Brain": the old "Vase/Face" example. What's it good for? Well, as you do this, stare at it and see both a vase, then a face and then flip flop back and forth between the two, I want you to keep this idea in mind. Ask yourself "how does this feel, this switching back and forth between perceptions of vase and face?" What's going on here? That little shift, the one that allows you to switch between vase and face is actually a switch in modes - a switch in brain function. A complete shift. Some may say from left brain to right brain. Though the side of your brain the shifts takes place within is not nearly so clean cut, a definite shift actually takes place and is viewable with PET and CT x-ray technology. Blood actually flows to those parts of your brain. (And a large abundance of that blood flow, flows to identifiable places on the right side of your brain.) Pretty amazing if you ask me. For some, the switch was a little tough to control at first (it was for me anyway when I was first exposed to it.) And for many it causes an outright conflict. But that's your goal: to make the switch between those different brain modes - something you control rather than a random event. And how do you do that? With practice. So here's your first exercise: completing the mirror image face (or the mirror image "other side of the vase" - whichever you might be perceiving at the moment). You could even try to do this by putting your finger on the screen and pretend draw the other half. The first picture is for right handed writers and the second is for lefties. And as you do this, you may even want to name out loud the parts of the pre-drawn face. Go right down the line-drawing naming out loud "hair, forehead, nose, lips, chin, neck" to further corner you in your language-based, analytic, abstracting left-brain. You can also print out alarger version of each illustration below by clicking on the button under each picture. skills you've already been exposed to. When you feel like you can draw the simpler vase-faces, it's time to step it up to the more complicated faces like the following, complex "monster" face. The directions are exactly the same: draw the mirror image. Yes, it's a lot more involved but if you could do the one's above, you can do this one. The next exercise - and probably the most amazing step for those of you with little or no drawing background is this one: the upside-down drawing exercise. Why is it so amazing? Because even if you thought you had no drawing skills whatsoever, you might well surprise yourself that you DO have skills there beyond your wildest expectation. And what a neat surprise would that be? At first glance can you tell what this picture is? You'll figure out part of it pretty easily I imagine, but it won't make sense to you in it's entirety unless you either do the exercise yourself or click here for the "correct orientation" of the picture - but I challenge you, don't spoil it for yourself. Do the exercise first. What's the exercise? Draw a rectangle in approximately the same shape as the rectangle surrounding the following picture. 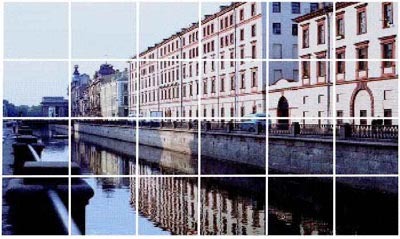 Duplicate exactly what you see in the picture within your pre-drawn rectangle (you can skip drawing the pencil :-) . Try to resist flipping your picture over until you're finished. You're in for a sweet surprise. I'll explain why this works so beautifully in a second - after you do this first exercise and a couple more examples. shaped cubes. Who'd have thought that's all this was? 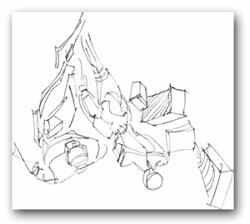 The classic example used in teaching upside-down drawing - at least among those who practice Betty Edward's "Drawing on the Right Side of the Brain" techniques - is that of Picasso's Igor Stravinsky. You can see it at either of the following sites. I highly recommend printing it out, (or right mouse click over the picture and pick "save picture as" from the pop-up window). Then after you print it out, turn it upside-down and draw it from top to bottom - literally from top to bottom (top to bottom as it sits there on your drawing table upside-down, so you'd really be starting at the feet...because it's upside-down. Got it now? :-). There's two links here just in case one won't open. Why does this work? Because flipping any picture upside down makes the normally familiar parts (like hands, wrinkly pants, the face etc. ), into something unfamiliar. And why is this good? Because, if the dominant left brain gets tired of trying to figure out what the heck is going on, it'll abandon the task. At that point your right brain (or that mode of your brain that has direct access to your senses) takes over and can do what it does best: it sees exactly what's there. Consequently, it makes using all those skills you saw on the "drawing basics" page that much more employable. But, you don't have to use any of those skills in order to make a giant leap in the realism of your drawings -- you can do that by just flipping the picture upside-down and drawing what you see. Now here's some another really fun exercise. It's called pure contour drawing. Pure contour drawing is probably the one exercise that pulls you deeper into the artistic mode of your brain more so than any other drawing exercise. Back in grade school, high school and even in college, drawing teachers always had us do some version of this exercise - but I don't think even they knew what the real outcome of this exercise was supposed to be. According to to the instructions given then, you were supposed to be able to draw a perfect likeness (or a good likeness anyway) of whatever you were drawing by never taking your eyes off it (it being whatever it was you were drawing). That is, by staring at your subject and NEVER looking at the paper you were drawing on, you were somehow supposed to draw a complete, proportional, to-scale reproduction. How often would this work? Like never. And if anyone did do a decent similarity, you knew they were cheating. I now have a whole new understanding of this exercise - and it's powerful. The point of it - as I understand it now - is to pull you deep into your observing brain. So deep in fact, you forget about time, you forget about your problems, you even forget about your anxiety around drawing. The end result, the drawing part of the deal, the actual pencil lines you left on the page, become secondary but have a sort of surreal freshness to them you just can't fake. 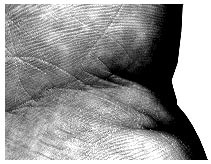 Now open you eyes all the way and you start noticing whorls and fingerprint type skin ridges there in your palm - the exact same kind you see in a police inking, completely unique to you and your hand. Now look at you own hand under some really good lighting and go through the same process. I'll bet you'll see all sorts of details there you've never paid attention to before. Want to try the pure contour exercise for yourself? and a timer of some sort. now position yourself in your chair so that you're turned away from your drawing paper like you see in the picture below. Turn yourself away from your drawing paper: don't look at it! Now place your concentration on your non-drawing, free hand like you see in the picture above. Pick a spot on your hand anywhere along it's border. This is going to be your starting point. With your eyes on this starting point, begin to move them in a direction along a border (an edge), of your hand. It doesn't matter which direction you move in, just start moving them. Move your eyes in tiny little increments - like 1 or 2 millimeter movements. (There's about 25 millimeters in an inch, so your movements are pretty small). Simultaneously, as you move your eyes, move your pencil on the drawing paper. Move it in what you would estimate to be the same 1-2 millimeter movement of your eyes. You're recording with your pencil the exact same edge you're viewing with your eyes: your drawing that tiny bit you're observing as you observe it. OK, make another little move with your eyes, and again, move your pencil, i.e. draw that little bit you just observed. Sooner or later you'll come across one of the large creases in your palm. What did Yogi Berra say years ago? "When you come to a fork in the road, take it!" And you'll find many forks in the creases in your palm. Just keep doing the same kind of incremental observations, and mimic what you see on the drawing paper. There'll be lots of little starts and stops, sudden changes of direction, both in what you see and then in what you'll record on the paper. That's exactly how it's supposed to go. No need to worry about results - it'll take care of itself! The last thing you're not to worry about is if your final drawing will look like anything on your hand. Don't worry, it won't - it's not supposed to. Your job is to keep moving your eyes around your hand and recording all the little jerks and creases and sudden changes of direction. Let yourself follow every little thing you see - and keep recording. You'll find yourself very deep into "the zone" in no time. When that timer "dings" you'll probably want to keep right on drawing. And do so but not more than 5 or 10 more minutes. The same way you don't want to start off jogging by running a marathon, you don't want to overdo these first exercises. I want you to say excited about drawing. Oh, and one last thing - don't lift your hand off the drawing paper. If your eyes make a jump, or you come to a dead end in a skin crease and you have to back your way out, just let your pencil record this. This'll add to the amazing texture of your drawing. If you have to "cheat"
If you just can's keep your eyes of your paper, or if you're tempted to steal looks at your drawing paper before the 30 minutes is up, let me suggest putting both your drawing hand and taping your drawing paper inside a big paper bag - that way it'll be a lot harder to steal looks at your drawing. Sign and date your drawing when it's done - you want to keep a written record of your progress. Done? Now look at your paper. I guarantee you'll be at least a little bit flabbergasted by the results. And I'll bet it's interesting in a way you never expected. I'll also bet you found very definite areas within your drawing you could recognize as parts of your hand - so you were actually doing realistic drawings in a most creative and honest way. Seeing your hand like this, slowing down to take in all that detail, will make your very own hand something foreign to your brain. You're looking at it in a way you never have before. And you'll be amazed by what you can draw once you make what you draw - whatever it is - unfamiliar to your eye. And how do you do that? Well, the same ways we're showing you here: by getting deeply involved with your subject and not worrying about how your drawings will look. In the step above, where you got deeply involved with your hand, the object of the exercise was to give you an experience of deep observation. It was to give you an experience of being pretty much lost "in the moment" as they say, in your artistic, observational brain. Pure observation was the goal. Accuracy was secondary. 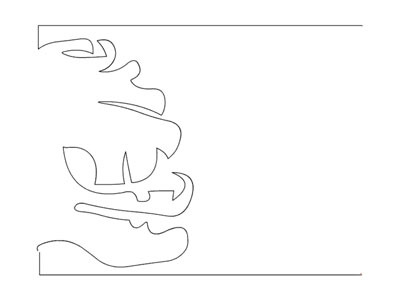 And that brings us to the next step: modified pure contour. Modified pure contour is this: adding the simple step of going back and forth between what you're observing and your drawing paper. That's all. And in so doing, you bring in those other things we spoke about on the Drawing basics page. Things like sighting, and reckoning angles and applying formats. All those now will make so much more sense after you've learned how to enter deeply into your observational brain - your "right brain". What will help you break up a really involved picture? Here's the answer: a broken up format. "Broken up" is one way to describe it, but a "subdivided" format is a more accurate way to put it. And "subdivided" sounds pretty academic. The core of the skill is analogous to this: a hunter will add cross-hairs to make his hunting scope even more accurate (and our hunter here is just hunting for pictures :-). What cross-hairs really do is break up the view. In that same way, adding cross-hairs to your viewfinder and then reproducing them on your drawing paper allows you to do the exact same thing. And though cross-hairs break your drawing up into just four squares, you can go way beyond that. You can break up your viewfinder and your drawing paper with a whole bunch of "crosshairs". So now you're looking at like say, 20 smaller, manageable areas within your subject. Each square now very reproducible. Now just imagine you have a drawing paper with those exact same lines pre-drawn lines on it, all drawn in the same proportion and intervals. Your job would now be to draw all those smaller sub-pictures within the overall larger surrounding format, treating each window as it's own format. Then you can go through your picture one square at a time making all those reckonings and measurements and sightings (using all those skills we talked about on the first "Drawing Basics"page) on each manageable section. Does that make sense? Like to try drawing this little scene yourself? can draw inside the pre-gridded format you printed out. The last skill mentioned on the drawing basics page was the skill of deciphering highlights, shadow, and tones and shades. We mentioned there diving right into color is too much to start with. Beginning with tones and shades of gray is the best place to begin. After mastering grayscale, you can work your way up to color. The next picture you're about to see shows both reflected and direct light. Scan closely around the picture - squinting will help - and look for areas that are just a little bit brighter than the shadows around them. Most of these areas of reflected light will be on the left side of the features. Why? 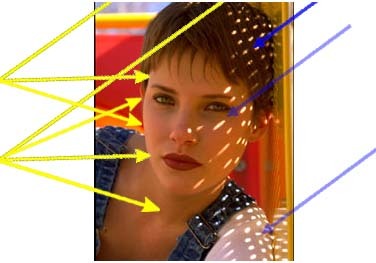 because features like the nose stick out just a little bit to catch that light or, in areas like the cheek, just plane face the direction the light is coming from. To tell all those different shades of tone and color apart in this color picture, well that's pretty tough to do if you're just starting out. But in this next picture the number of colors has been reduced the to just three: black, white and one tone of gray. That's all there is. And doesn't it make it a much more "understandable" picture? The subject is still recognizable even with all the color taken out. Notice anything else? There's real logic to light. It's as logical as the physics governing a bouncing ball. Well almost. It's as logical as a bouncing ball you tossed at a wall in room in outer space and in a vacuum. If you throw a ball in this outer space room, it bounces off things until something catches it. In the same way, light comes into a room, it bounces off a wall, a certain amount gets captured by the wall it hits, but some will still bounce off until it hits something else. Now let's pull everything together you've seen on this page. By first reducing all the complicated colors to grayscale, you've got a manageable, contoured picture. 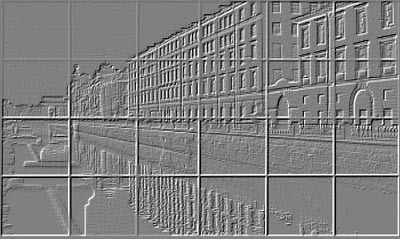 By overlaying a grid on top of our model, you can break the seemingly complicated picture into a group of much more manageable mini-drawings. Each square within the grid can be treated as it's own little drawing. Are there negative shapes here? Where to lines and edges enter the square? What angles do they form with the vertical and horizontal lines of the grid? What are the different shapes of the colored areas? How much of the smaller grid does each shape (gray, black or white) occupy? That is, what proportion of the square does it fill? Now that you've worked your way through the two basics of drawing pages, you really do have at least a conceptual idea of how you can really draw great reproductions. There's a really fun drawing program out there on the web - different than the YouCanDraw.com program - that builds right on top of what you've been shown in this last section (where you draw "grayscale" or black and white pictures on pre-made grids). I bought this product about a year ago and found it to be a great "jump-start" allowing people to make great drawings from photos with little or no drawing background. You can see it at ArtSkills.com (Click on the button just below). The program doesn't talk overtly about the skills of drawing per se, but you get the gratification of actually making very recognizable reproductions rapidly. It's a fun program. But to really master drawing faces and caricatures there's more to it than that. You really need to master all those skills we've talked about here. You've got learn about anatomy, and how light and shadow work on the face in a more intimate way. You need to learn to see beneath the surface and recognize what's taking place literally under the skin. You need repetition and practice, practice, practice. (I know, that kind of threw a wet blanket on your enthusiasm. But it's true: practice really is the key.). But you can really accelerate your progress with a good teacher - or a program that spoonfeeds you assignments, gives you tons of detailed explanations, delivers lots of interactive learning aids, and exercises that cut through to the really important part of each lesson. You need to apply all this "basic" stuff to each area of drawing and in particular to the art of drawing faces and caricatures. Does such a program really exist? Yes. And you can see it at YouCanDraw.com.